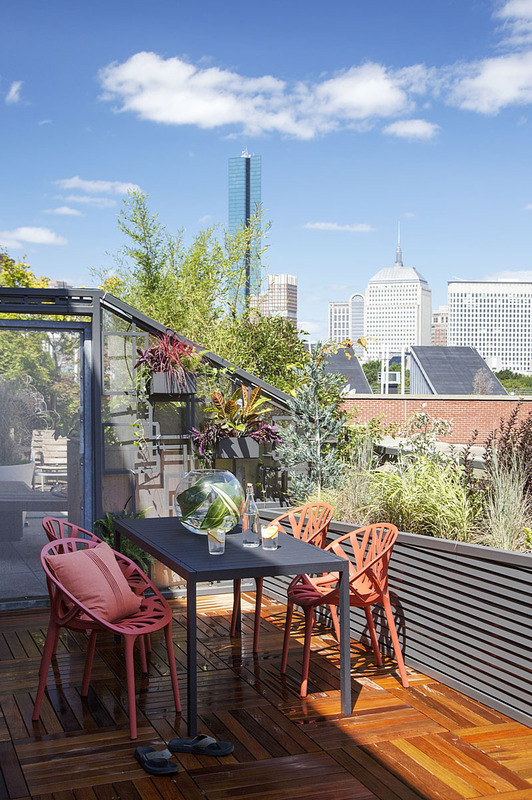 ZeroEnergy Design (ZED) together with Ralph S Osmond have given this contemporary Boston loft a makeover, keeping it open and fresh, and suitable for an expanding family. Just inside the front entrance is a small sitting room with a wall full of floor-to-ceiling white cabinets. This area can be used as a home office (there’s a small desk built into the cabinets) or as a sleeping area for guests. 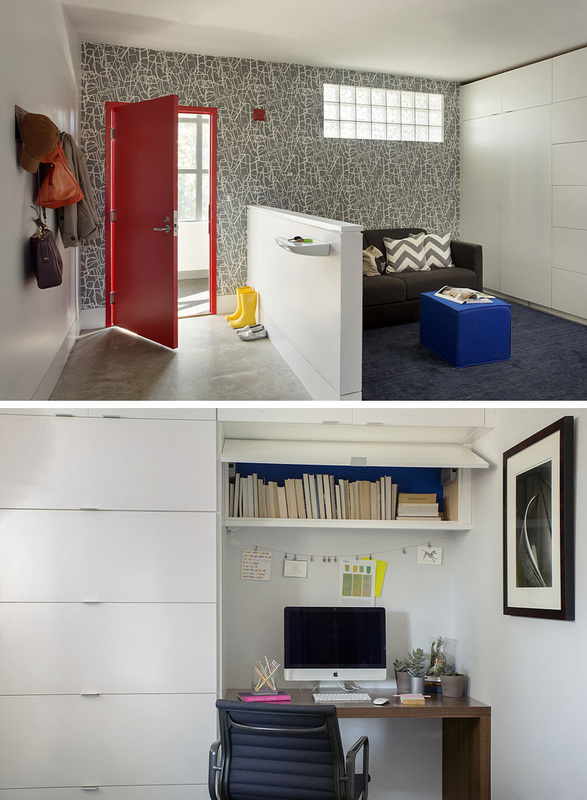 A red door and graphic wall paper give this space a bright and fun feeling. Opposite the entryway and sitting room is a simple bathroom. 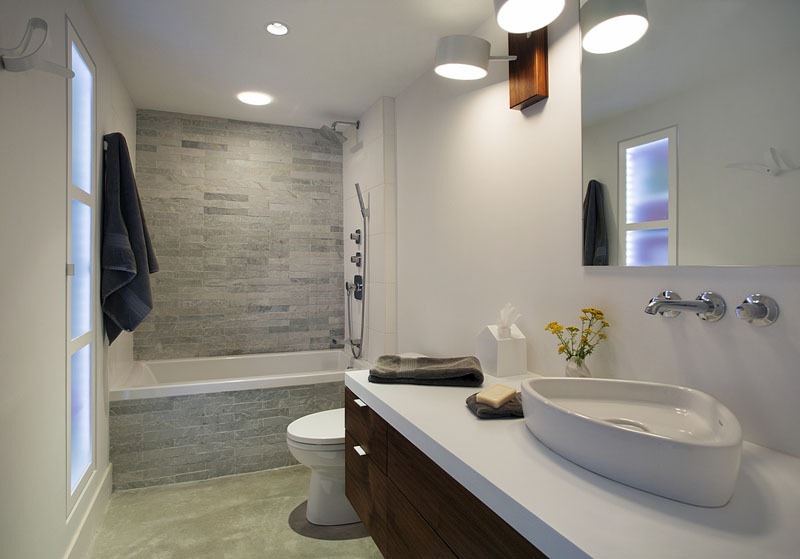 Light grey rectangular tiles have been used in the bath/shower, while a triangular-shaped white sink sits on the on a dark wood vanity. Next to the bathroom is a nursery. Rectangular opaque windows glow from the light in the living area, while wall decals of children playing add a touch of fun to the room. Stepping back into the small hallway, you walk out into the main living, dining and kitchen area. In the kitchen four white pendant lights hang above the long wood and white cabinet island that has a slightly raised bar with accompanying stools. A bright orange backsplash adds a pop of color above the sink, while a walnut wood feature above the cabinets wraps around from the wall and up onto the ceiling. Beside the kitchen is the living room, where a wood fire place is framed in a white display shelf, and sits in front of dark stone accent wall. 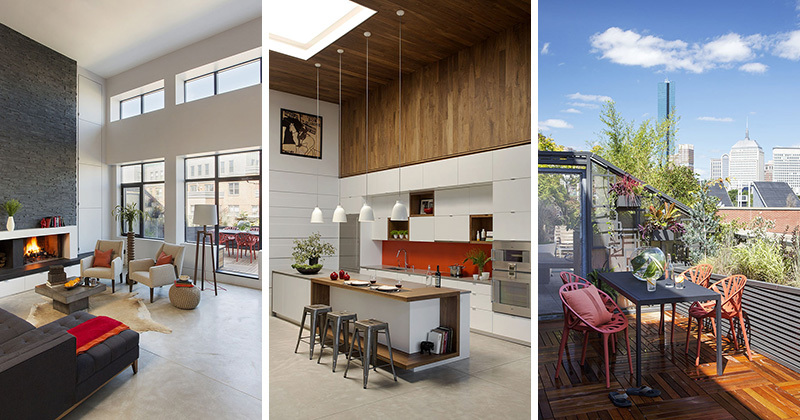 Large windows and glass doors to a small patio provide extra light in this open room. Going outside, the wood patio is furnished with a black table, and bright orange chairs. The potted plants in this space don’t interfere with the spectacular view of the city. 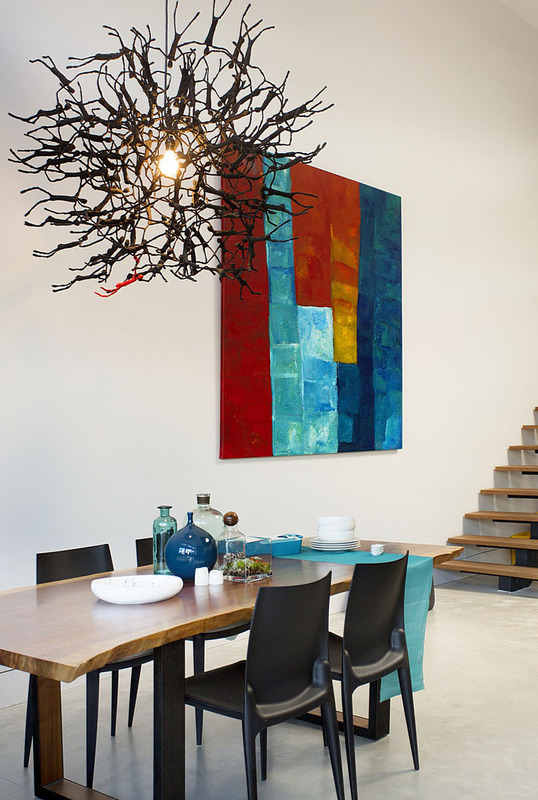 Back inside, a wood dining table sits below a sculptural pendant light made from human-like figurines. A wall mounted painting with reds, blues, yellows, and whites ties compliments the various colors throughout the interior. Next to the dining area, walnut wood stairs with a black hand railing lead to the lofted part of the home. Underneath the stairs, a small area has been set up as a play area, and you can see the windows that look into the nursery. 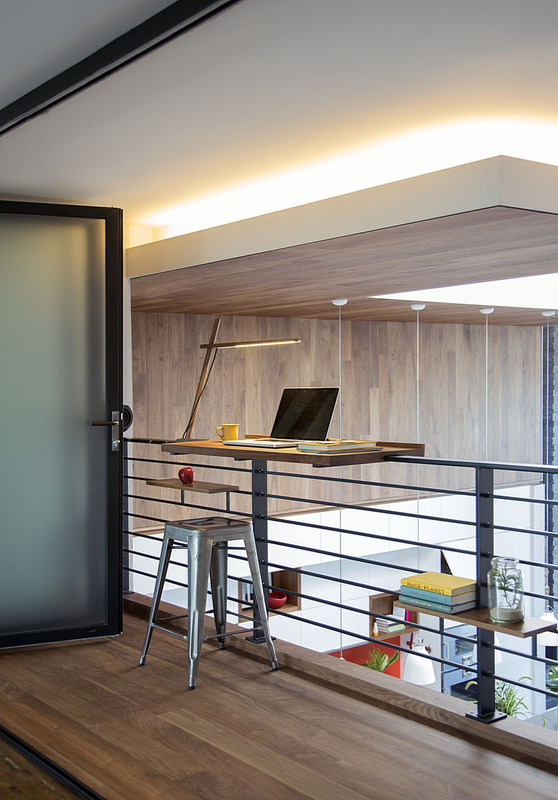 At the top of the stairs, a wood desk has been attached to the black railing to create a work space that can easily view downstairs, while hidden lighting in the ceiling provides an extra glow to the lofted level. Behind the desk is the master bedroom, where opaque folding glass doors have been added to provide privacy separating it from the rest of loft. 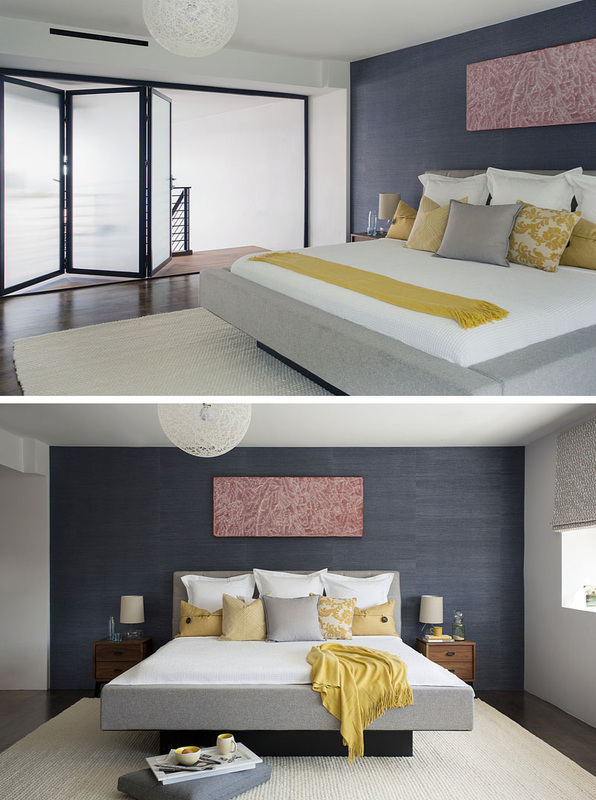 The light grey, soft framed bed sits in front of a dark colored accent wall. The master bedroom has a walk-in closet, with circular patterned black and white wallpaper that stands out among the white built-in shelves and racks. Large, dark grey rectangular tiles and wood flooring give this master bathroom a sophisticated look. The stand alone tub and shower area are slightly elevated above the rest of the room, with a glass partition separating the shower from the white vanity.